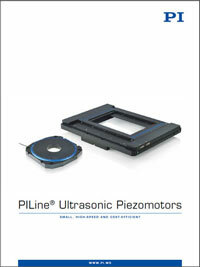 (Nanowerk News) PI (Physik Instrumente), a leader and solution provider in motion control and precision positioning components and systems, is releasing a catalog of its ultrasonic piezo motors, stages and positioners for precision motion and automation applications. The products range includes compact, high speed, or cost effective customized OEM designs. Ultrasonic piezo mechanisms are direct drive motors with self-locking properties. They cover a very large dynamic range with velocities from microns/second to 100s of millimeters/second. The ceramic nature makes them intrinsically vacuum compatible. Easily integrated into other components, piezo motors do not generate or are affected by magnetic fields, making them ideal for E-beam and electron Microscopy applications. Small, highly responsive digital motion controllers are available to match the performance and properties of the ultrasonic drive principle. Standard positioners include thumbnail sized miniature rotary stages, matchbox-sized linear stages and large XY stages for applications such as scanning microscopy. In addition to the many standard products presented in the new catalog, PI can quickly modify existing product designs or provide a fully customized OEM part to fit the exact requirements of the application. Applications include semiconductor applications, photonics, bio-nano-technology, metrology, microscopy, micro-manipulation, including cleanroom applications.